In addition to sharing Mother Lear with new audiences around the Bay Area, we launched our "Caesar Suite" with two new works inspired by the late Roman Republic and Shakespeare's Julius Caesar. 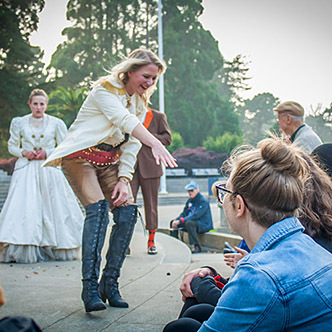 We deepened our relationship with San Francisco Recreation and Parks with our productions at The Palace of Fine Arts - the all-female Roman Women - and at The Music Concourse in Golden Gate Park where we staged our circus and opera infused CAESAR MAXIMUS. Roman Women - In spring and early summer The Palace of Fine Arts in San Francisco hosted this ritual performance. Featuring live instrumentation, classical text derived from Shakespeare's Julius Caesar, and physical theatre and dance generated by the all-female ensemble, we explored the public and private lives of the women in Julius Caesar, in the late Roman Republic, and in the 21st century - imagining and recreating secret rites and hidden mysteries. "...like a living, moving piece of abstract art." “...simply incredible. I will continue to be inspired by this for many years to come. Brava!" "Roman Women, as with all We Players shows, is truly a unique experience. You are enveloped by the place, the characters, the word, the music, the stories. You are in direct relationship to it all." CAESAR MAXIMUS - San Francisco’s Music Concourse in Golden Gate Park provided the stage for this new adaptation of Julius Caesar. Incorporating the nineteenth century popular entertainments of Opera and Circus, this multi-disciplinary, site-integrated production explored power, grief, and popular action and opened up Shakespeare’s greatest political parable for our own tumultuous time. "POWERFUL, PROVOCATIVE, RELEVANT, MOVING, AND EXCEPTIONALLY WELL-CRAFTED AND EXECUTED"